Wake each morning to our sumptuous traditional breakfasts using locally sourced produce. In addition to our fried breakfasts, our daily specials can include kippers, kedgeree, welsh rarebit and smoked salmon. All our drinks are Fairtrade. Croft Guest House is conveniently located in the very heart of Cockermouth but is away from the traffic on a quiet back street. See directions for our location. The town centre is just a short stroll away with it's shops, pubs and eating places. We are also fortunate enough to have our own off-street parking area. Within a short drive of Cockermouth is some of the most dramatic and unspoiled lakeland scenery including Wastwater - voted Britain's best view! Stay here 2 or 3 times a year. A brilliant B&B! Lovely rooms, great breakfasts, excellent location and lovely hosts. Probably my favourite place to stay in the Lakes. Private parking too. What's not to like?? Thanks Glenis and Dave for another excellent stay with friends! A warm welcome and quickly shown our rooms which had all the facilities we were expecting . The house seemed newly decorated throughout and was very clean and tidy. Our room was quite hot but opening the window cured that. All the fittings seemed quite new and of a high standard. The house is very close to the town centre with sufficient parking for our group’s cars. Breakfast was perfect with everything freshly served according to our wishes, as plentiful as we wish and a ‘today’s special’ on offer too. All together Croft Guest House is a great place to stop and made a perfect base. No hesitation in recommending a stay. Croft House is a real treat to stay at. All the décor and furnishings are top quality and the hosts Glenis & Dave are simply the best! Glenis certainly knows how to serve up a cracking breakfast...it was delicious. Hope to return again soon for some pampering. We stayed at Croft Guest House for four nights in late February and had a wonderful stay. We were in Room 5 which was beautifully furnished and everything was super clean. The breakfasts were a delight with daily specials. Everything at Croft House was first class and it was our pleasure to stay there - many thanks. We had the ‘occasion’ room, which was lovely. Tastefully furnished, spotlessly clean and very comfortable. Lovely dressing area and a large shower too. The owners are professional and friendly. What would make this a 5 star review? Extending breakfast times to 10am at weekends. We thoroughly enjoyed our 3 night stay at Croft House. The accommodation was very clean and comfortable with everything you could wish for and more besides. Breakfast was great with plenty of choice and freshly cooked full English or variation daily. Would thoroughly recommend to anyone. High quality guest house. Lovely breakfast including delicious homemade marmalade and daily specials. We stayed for 3 nights in this incredible hidden gem called Croft Guest House in the heart of Cockermouth to celebrate my husband's birthday. This place is so immaculately clean, luxurious and modern. Breakfast so scrumptious with daily specials too. Small touches makes a difference. I've never stayed in a place supplied with hair straightener along with the usual hairdryer.Glenis you are up there. My daughter and I stayed at Croft Guest House for 3 nights to attend a family wedding. We were absolutely delighted with the room, location and welcome. The breakfast was to die for - and would give some of those 5 star hotels a run for their money. Honestly I can only speak positively about our stay. Thank you both very much! Parking in the centre of the town, welcome & helpful hosts, comfortable bed and a fabulous shower room. This is simply the best B&B! We stayed over here on a Saturday night in July for a wedding - what a lovely stay! We were on the top floor in a standard double room - comfy bed, wonderful pillows, nice décor... we had a great sleep! Plenty of ventilation, two windows so didn't have to worry about it being too hot. As for breakfast in the morning, delicious! My favourite part was the homemade granola, sooo nice! We enjoyed our stay at Croft Guest House. Lovely clean, light & airy room with very comfortable bed. Delicious breakfast with home made marmalade and jam. Central position but on a quiet back street. This is the perfect base for exploring Cumbria and The Lakes. A quiet town, but just the right size to walk around, good restaurants, no crazy traffic, easy to get into and out of for day trips. Our room was spacious, beautifully decorated. Our hosts were available, helpful, delightful. Breakfasts creative and delicious! Just stayed three nights at Croft Guest House and we loved it. 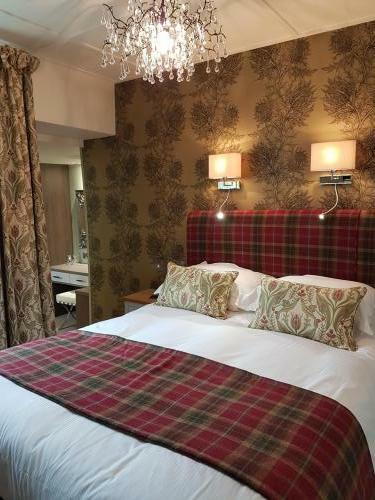 Beautiful room, very clean,fantastic breakfast and all in the centre of Cockermouth and free parking. We have no hesitation in recommending this guest house. Glenis & Dave are great hosts - we look forward to seeing you again. Lovely stay in this charming Guest House. Bed was amazingly comfortable. Slept like Babies.Excellent Breakfast table with plenty of choices every day. Friendly Hosts.. Highly recommended . Wonderful hosts, beautiful rooms and amazing homemade breakfast. Dave and Glenis gave us a lovely warm welcome and offered advice on the local area. The attention to details was exceptional, fresh milk, chilled water, BATH ROBES, fluffy towels, luxury linen, umbrella ... too many more little touches to mention made for a stay more like a 5* Spa Hotel. Glenis’s breakfast again offered just that little bit more than expected ... home made daily specials (caramel oranges!) locally sourced produce and Dave’s hospitality!! Lovely stay at Croft House. Arrived and was greeted by the Owner and was also given an upgrade to their luxury room which was Beautiful. Lots of refreshments and toiletries given plus the extra of Fresh Milk & Water. This for me is a big bonus as I hate UHT cartons. Wonderful sleep and Breakfast was exceptional. We will definitely return. We recently stayed at Croft Guest House for an overnight visit to Cockermouth the celebrate my birthday. We chose this B & B because of the great reviews we read, and were not disappointed. The rooms are beautifully decorated, pristine, super clean and comfortable. Glenis and Dave are lovely hosts and did everything to make us feel welcome - including a free upgrade and the most wonderful vegetarian breakfast. We would definitely stay here again and recommend to others without hesitation. I stayed here on business. I would recommend Croft Guest House to anyone looking for accommodation in the area. The staff were very welcoming and the room well presented and bed very comfortable. I would definitely stay here again. Dave went out of his way to make our stay special. The breakfast was one of the best we've had. A full English breakfast or a daily special - scrambled eggs and smoked salmon on the morning we were there. Fresh fruit salad and delicious homemade jam! Just one comment, which isn't a complaint, if you get hot in bed ask for a lighter quilt. Very enjoyable three day stay at the Croft Guest House. Clean, comfortable, quiet and very central for Cockermouth. Great breakfasts and helpful info about where to eat. Highly recommended. Had the best room in the B&B, breakfast top notch, cant knock it at all!! Lovely accommodation, very clean and beautifully decorated. Nothing too much trouble. Glenis provided information of local eating places (Mondays some eating places closed on Mondays). Great breakfast. Would recommend. First class guest house very warm welcome and spotless clean along with a first clss breakfast with excellant presentation. Well where do I start? The host and hostess were extremely helpful and friendly. The room was absolutely first class, clean and well decorated. We had a super king size bed that was more comfortable than our own. The breakfast was absolutely heaven, the best I have had anywhere. It is a 3 minute walk to the main high st with lovely little shops that make up the beauty of this quaint town. We usually stop in hotels but if all B&B's were this good then we will have to have a rethink. Stayed 1 night in this excellent Guest House. Room on top floor was cosy - a very comfy king size bed. Superb breakfast with good locally sourced food. Myself and two other walkers recently stayed at your guesthouse and I just want to say how much we enjoyed staying with you, the weather was pretty awful and without your hospitality our holiday wouldn't have been so good. You are both fantastic at making people feel at home and your service and breakfast couldn't be any better. Thank you very much once again for making us feel so welcome in your lovely guesthouse and wish you all the best for the future. P.S. Your homemade strawberry jam is fantastic! Everything was spot on. Lovely room, upgraded to a king size bed at no extra cost. Bed vas very comfortable with bedding Right for the season which gave us a very good nights sleep. Comfortable chair to sit on, plenty of plugs for phones etc. The room was spacious and beautifully decorated, toilet had bath and shower and decorated beautifully again. We had a lovely breakfast, good quality ingredients cooked how we asked. Everything from fresh fruit to home made marmalade and jam and fruit juice to help yourself to. We got a nice welcome when we arrived, everything was explained and keys for getting in and out when we wanted. Hosts took time for a wee blether when we pail our bill on leaving. The warm and friendly welcome and the hospitality provided by David & Glenis. No problem was too big and the breakfast they served was the best I've ever had anywhere. Nothing to dislike!! 5 stars all the way. Clean, comfortable, well appointed accommodation. Enjoyable breakfast including healthy choices. Owners very friendly and helpful and kindly changed our room from the second to first floor after noticing my husband's difficulty with the stairs. Close to a variety of restaurants for evening meals. Would highly recommend. The rooms were exceptionally clean and a decent size. The bed linen was clean, starched and of good thread count. The room we had was a twin that was tastefully decorated in a modern contemporary style. Parking was on site and the owners let us park most of the morning so we could walk around and discover this quaint town. The B & B is in town, but in a quiet street which was only a short walk of 2 minutes down to the main street. I loved everything about this small quaint B & B and would recommend it to anyone looking for accommodation in the ancient market town of Cockermouth. The breakfast is freshly cooked (The Full Monty) with a good assortment of cereals, fresh fruit salad, yogurts and fruit juices. The breakfast room is clean, comfortable and the hosts are friendly and accommodating. The showers are small, but the owners have told me they are in the process of upgrading and enlarging them. Help with bags. Beautiful room, every need catered for. Excellent food and choice. Nothing too much trouble. I was recommended the Croft Guest House in teh Lonely Planet GB Guide. I've always trusted these guides, and I wasn't let down this time: the stay was excellent! Cockermouth is lovely, and the stay was very peaceful. I'd particularly recommend the home-made muesli and marmalade. If visiting, try the vegetarian restaurant (Quince and The Medlar, I think it was called--we couldn't get in, but the food smelled awesome). Very welcoming and helpful proprietors too (Guest house, not the restaurant :-) )! Thanks! On arrival we was made very welcome,guestfhouse very modern and very clean,breakfast was lovely plenty to choose from,definitely recommend to family and friends . Dave and Glenis were very welcoming. Rooms were immaculate, with a good selection of teas/coffees/hot chocolate in the room and complementary toiletries in the bathroom. Very comfortable night's sleep. The breakfast was excellent, again lots of choice and well presented. Dave and Glenis were very attentive. The Guest House is located in a quiet street within a short walk to the centre. Would stay again and certainly recommend to others. Spotlessly clean accommodation.Stylish small double. Well equipped including efficient hairdryer. Wide ranging excellent breakfast options, leave room for the home made marmalade! Very comfortable, great location in Cockermouth. David and Glenis very friendly and helpful. Lovely breakfast. Excellent location, extremely friendly staff who went above and beyond. My partner and I will definitely be looking to stay with Dave and Glenis again in the future. We were made to feel welcome from start to finish. Stayed at Croft guest house for 6 weeks and was really impressed with the rooms and service on offer. Bedrooms where very spacious and immaculate with on suite bathroom. A great selection for breakfast from cold to hot food served with a smile. Dave and Glennis where always on hand and nothing was ever too much for them. Guest house situated a 2 minute walk from the town and all amenities on hand. I would recommend the accommodation to anyone visiting Cumbria. Spent one night here. Owners couldn't have been more helpful, the room was lovely, and the breakfast was great. Would definitely stay again if I'm in the area. Lovely central locaton, parking by arrangement. Good-sized and very well-equipped double room. Wide range of items to choose from at breakfast and the cooked breakfast was local produce. Very welcoming and happy to stay again. 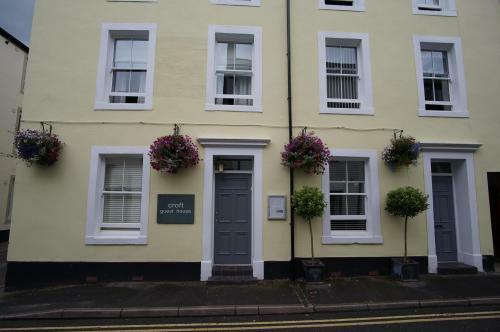 In a quiet side street in the centre of Cockermouth, Croft Guest House is delightful. High quality furnishings throughout,thoughtful hosts and excellent breakfast choices. Would definitely stay here again and recommend to family, friends and colleagues. We stayed for 4 nights 26-30 September and were made to feel welcome from the start. There was the kettle with teas, coffees and hot chocolate, free Wi-Fi, hairdryer, sewing kit and umbrella. The beds were very comfortable with down/feather duvets. Breakfast was a wide selection of dried fruit and nuts, cereals, fresh fruit salad, and cooked breakfast with a different special each day - smoked salmon, smoked haddock, kipper fillets, kedgeree. It's a short walk to many pubs and restaurants. We would definitely stay here again as do many visitors. Very clean and well presented with added extras such as sweets and bathrobes. Our room was large enough with a decent bathroom with shower. Breakfast was top quality, using local ingedients with daily specials available. Located in the centre of twon it has parking to the rear, I would guess that unless the B&B is fully booked finding a space would not be a problem. Comfortable, clean and a friendly atmosphere. Frequent repeat visits, from clients, attest to the quality. The breakfast can last you "all day". Well you certainly know how to run a b and b. Beautifully clean, cosy, and well appointed. Breakfast exceptional, ~Well done. Just looking for excuse to stay again! We had the downstairs twin room which was beautiful with a big modern bathroom. Lots of choice at breakfast, including a daily special which we've never encountered before. All in all we had a fantastic time. We enjoyed 4 nights in great comfort here. Our room was clean, warm and spacious with all the luxuries one would expect in a hotel. The peaceful outlook away from the main street gave us good night sleeps on the comfortable beds. Breakfasts were excellent with a great choice and home baked bread made lovely toast. Daily specials were stylish and so tasty. There was car parking on site and even space for our tandem. This is really a hidden gem. Our August bank holiday stay at The Croft Guest was a great experience, the place is well looked after by a very professional and friendly team, 4 start? Probably more than that. Breakfast is excellent. Conviniently located near main town centre yet tucked away in a very quiet corner. We very much enjoyed our stay in Cockermouth. The guest house was comfortable, modern and quiet and the proprietor most welcoming. The hotel was recently modernized and has beautifully appointed bathrooms and bedrooms. We recently had the pleasure of spending a long weekend at the Croft Guest House in Cockermouth. It had been recommended to us by our son, who said he'd heard good things about it. The owner was very friendly and helpful and the whole place was very clean and tidy. The beds were really comfortable too and our teenage daughter was pleased to find good wifi was available. The breakfast was terrific. We loved the fresh fruit and the Full English was as good as anything I've had. It was all finished off with lovely home made toast and marmalade. I tried the kedgeree one day and that was tremendous. The lady who served breakfast was just so nice and friendly - nothing was too much trouble. I can thoroughly recommend Croft Guest House to anyone wanting to stay in the area. Once again we had a lovely time whilst staying at the Croft Guest House. The room was very clean, a good size and very comfortable. Breakfasts were cooked to order with local ingredients being used, there was also a "special" every day too. We will definitely look to book here again when we are next in the area. We booked as a family to attend a wedding and the whole experience and stay topped off a fantastic family event. Very pleasant and helpful hosts who made you feel really welcome and took interest in you as guests without been OTT. The decor and facilities were on par with a small boutique hotel rather than a typical bnb. We would highly recommend Croft House and if needing to stay in the area again will be back. A vey welcoming atmosphere. Comfortable rooms, with plenty of "little extras" one might not otherwise expect. The well cooked breakfast will keep you going all day. We were delighted with our stay at Croft Guest House. We were warmly welcomed, the room was spotlessly clean, and the breakfasts were superb. Added to which the location is excellent - just a short walk from fine restaurants and pubs. We were really pleased with our choice for a Saturday night stay in Cockermouth. Despite arriving two hours earlier than we'd stated on our booking, we were warmly welcomed and shown to our room by Eddie who advised us about places to eat and the need to book or go out early. 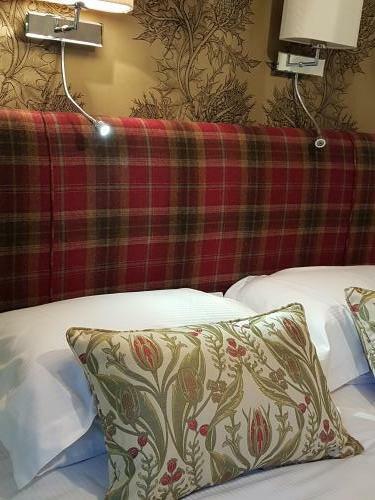 The room was spotless, not too small, with lots of attention to detail such as :- plenty of tea, coffee etc.., plugs available without crawling on the floor, nice range of toiletries, bath robes. The bed was very comfortable and a good night's sleep was had. Breakfast was really excellent with a wide range of cereals, fruit salad, dried fruits , welsh cakes, homemade bread to chose from before the cooked breakfast. The cooked breakfast was fantastic also. On leaving we found our car battery was flat and Eddie provided invaluable assistance helping us get it started. Thank you for a lovely visit , we hope to come again soon. Clean, attractive rooms; good welcome and throughout the stay; lovely breakfast room with exceptionally good choices for breakfast. Don't be put off by the initial view of the narrow road where Croft is situated. Just one niggle - there were road works in the main street and only 1 possible way into the road because of the one way system: we had to go round 3 times before we worked out how to get there. An email with directions would have been appreciated. 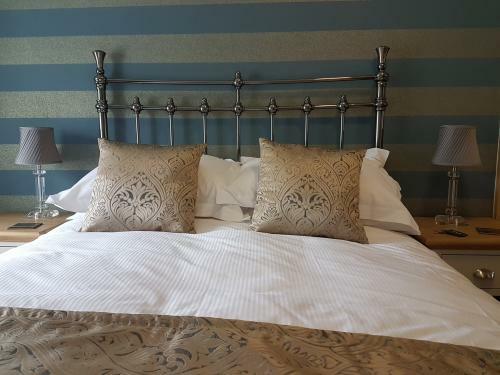 First class bed and breakfast; large well decorated room with good facilities, outstanding breakfast and excellent attention to detail from welcoming hosts. Highly recommended, what more can I say? We couldn't have asked for better hospitality. We think this is excellent value and the location was perfect for exploring both the lovely town of Cockermouth and the beautiful surrounding area. The breakfasts were sensational especially the specials! I would recommend the Croft to anyone! Wonderful little find. Hosts are very welcoming. We stayed in the family room which had a seperate small section which housed the children. Much better than the usual extra beds crammed in one room. Will definitely be back when next in the area. We stayed for two nights over the bank holiday & had a very relaxing time.Eddie the landlord was very accommodating in all respects, nothing was too much trouble.We would definitely return,also we would not hesitate in recommending this place to others! Had a lovely stay at Croft Guest House. Lovely room and facilities + the little extras that make a difference like bath-robes! Eddie is always on hand to help out if anything is needed and the breakfast was delicious and plentiful. We stayed at the Croft Guest Houes as a base to walk the Coledale Horseshoe. We found the two rooms very comfortable. Lovely decor. The breakfasts were the best we have had in the lakes (and we've stayed in a few B&Bs...! ). Will be booking again when we are walking in the North Western or Western Fells. Thank you for a great stay. Stayed 1 x night Saturday to Sunday and this place is a gem on a back street! 5 mins walk from all the pubs and restaurants. Great hosts and a fantastic breakfast with the best tasting sausage ever. Would highly recommend a stay if your in the area. My partner and I stayed at Croft Guest House for the night as we explored Cockermouth. We can't rate the service highly enough - lovely, comfortable room, nice toiletries supplied, yummy biscuits, delicious breakfast, and Edward has excellent local knowledge. The bar he recommended to us for dinner was SO good. Looking forward to returning - we've already recommended to our friends! Excellent accommodation. One of the most comfortable beds we have slep in. A quiet location yet just off the main street, and with parking spaces. A well furnished room with a table just big enough to take a lap top. No guest lounge but Cockermouth's welcoming pubs are literally just round the corner ... and I don't remember having a better breakfast, with first rate produce and individual touches such as scots pancakes. Excellent.